And again, wow for your cross stitch scarf. Beautiful scarf! Thanks for sharing. I'm knitting up this pattern right now. Thanks for sharing! Yes, if you read the instructions for row 2 it has K2 at the end. Only if you don't want the two edges to look the same. 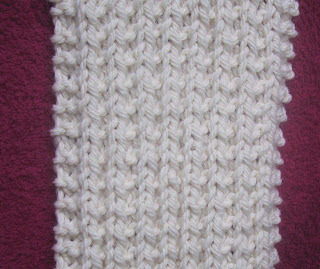 If worked the way it is written there will be a purl stitch next to the garter stitch edge on both edges. Yes and following the sequence you have been using the next stitch is a purl. Hi, I love the scarf pattern. Thank you! Just one question, mine is curling on the edges, did I do something wrong? It looks just like your picture and I followed the pattern. Any suggestions? You could try blocking it. Next time make the garter stitch border wider and it should lay flatter.